If you want to experience the freshest, highest quality seafood from around the world, you can take to the seas – or just visit us at Red Lobster, where each day we bring some of the world’s best seafood fresh from the water to your table. 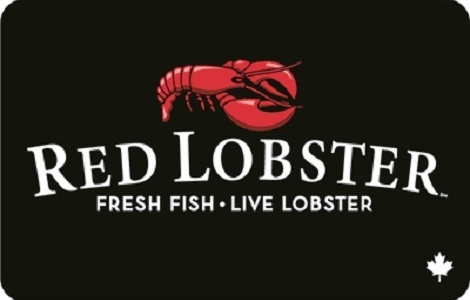 Order your bulk Red Lobster Canada Gift Cards from National Gift Card today! Let us handle the fulfillment. TREAT THIS GIFT CARD LIKE CASH. Your purchase, use or acceptance of this Gift Card constitutes acceptance of the following terms and conditions. This Gift Card is issued by and represents an obligation solely of RLSV, Inc. (“Red Lobster”). Each time you use this Gift Card, we’ll deduct the purchase amount from the balance until you’ve used the full balance of the card. You can add to the card balance at any time. This Gift Card cannot be redeemed for cash (except as required by law) or applied as payment to any account. The value of this Gift Card will not be replaced if the card is lost, stolen, altered, destroyed or damaged. This Gift Card does not expire and may be used at any participating Red Lobster restaurant located in Canada. Approval required to advertise this Gift Card.